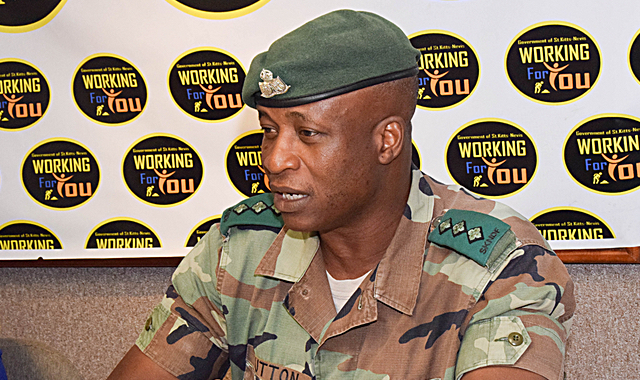 Basseterre, St. Kitts, 12th April, 2018 (MyVueNews.com) – The prominent threats of narcotic trafficking, human trafficking and the proliferation of small arms and ammunition will be the focus areas during this year’s Exercise Tradewinds, according to Captain Kayode Sutton of the St. Kitts-Nevis Defence Force (SKNDF), who is the chairman of the local organizing committee for the event. Speaking on ‘Working for You’ on Wednesday, 11th April, Captain Sutton talked about criminals that are getting more sophisticated. According to Sutton, traffickers are not only using the traditional super-fast speedboats, they are now employing the use of submarines. In addition, he noted that “open sea borders are quite a challenge to police”. In times of natural disasters, the role is to support the National Emergency Management Agency (NEMA) in terms of security, logistics and other areas.